Ciarán Morrison & Mick O’Hara (best known as Double Z Creative) is working on script writing duties for Transformers: Rescue Bots Academy. Shows delivered by Double Z are known to contain high quality writing and high entertainment value. Irish kids who grew up in the 80s/90s may recognize this dynamic duo very well. This news indicates possible high quality content for our upcoming show. Their official website also mentions the planned episode count for the show. Equaling its predecessor; Transformers: Rescue Bots, Academy will also feature 104 episodes but at 11-minute runtime each (as opposed to the original’s 22-minute format). The episode count has doubled since we last heard about the show. Glad to see Hasbro is pulling out all the stops to make Academy as good as can be! I wonder if this 11 minute Long format is the norm from here on out for any future transformers shows. When Hasbro gets back to the big sweeping space operas again, it'll get back to 22-24 minutes. Right now though, this is more narrow band bite sized slice of life space operas. So 11 minutes is fine. 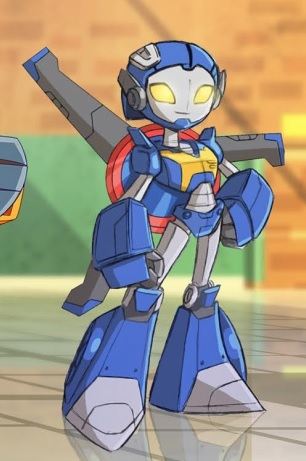 I'm looking at these guys Twitter and I'm half-expecting this new Rescue Bots show to be less "pure" and more TV-Y7 than the original show. If it means we get a crazy/Deadpool-lite female Whirl, I'm all for it. I think that's the format of most modern shows for young children. It has its uses. Nowadays, most shows are watched through online platforms. You are not tied down to your TV. It's easy to see how that might be used during the drive to kindergarten/school or during other activities when you want to occupy a child for 10 minutes instead of 20. I used to love Zig And Zag … i even had their cassette single . 11 minute episodes is a bit of a shame , but we live in a world where everything from houses to chocolate bars is getting smaller . I feel more like Metroplex every day . They were also huge in the UK. They had a segment on the Big Breakfast a sadly dead show that used to air every weekday years ago. They would interview celebs etc, I remember loving it when I was young. Now do I feel like they were the first choice for this?… no. I think they can bring a lot to the table and can write some really interesting stuff but I cant see Hasbro/boulder media letting them write unchecked on a pre-school show I don't know who the show runner is on RB but if I wanted to get an idea what the new season is like I'd look at him since he/she will be the one in control. Now why I don't think they were the first choice is because for those who don't know Ireland offer some amazing tax incentives to the creative industry right now so by getting local talent it's a nice way to save money. Looking forward to this show, and I’m glad the episode count has doubled. This is really something only super meaningful if you were a 90s Irish kid or a late 90s UK kid. The creators of Zig and Zag are writing for Rescue Bots. Zig and Zag are puppets from children's tv, in Ireland best known for their appearances on a show called the Den. And to say they are cultural touchstones is an understatement. They were THE cultural touchstones at the time. They dominated the Irish live media circuit for almost 15 years. They had movies and books and music videos, and were VERY RACY.